The aim of the project is to study the problem of different forms of knowledge, first of all to analyse the modern forms and functions of knowledge. In the course of the research of the subject it will be also the part of our task to answer such fundamental questions as the relationships of knowledge and idea, knowledge and belief, knowledge and supposition, as the everyday and scientific, the non-value based and ideological, the personal and impersonal forms of knowledge, the connection of the eternal and “hic et nunc”, objective and subjective, structured and amorphous, universal and particular concerns of knowledge. The main large categories will be the characterisation of scientific knowledge as well as the description of the relationship of scientific and non-scientific knowledge. The aim of the Von Neumann Project is to do and coordinate philosophically motivated historical research on John von Neumann, the Hungarian born mathematician (1903-1957). During the first phase of the project (1997-2000) the research focussed on von Neumann's activity in the area of foundations of quantum physics. This phase of the Project was coordinated by M. Stoeltzner (Institute Vienna Circle, Vienna, Austria) and M. Rédei (Department of History and Philosophy of Science (HPS), Eötvös University, Budapest, Hungary), and was funded by the Aktion Oesterreich-Ungarn, by the Hungarian National Science Foundation (OTKA) and by the Austrian Science and Liaison Office of the Austrian Institute of Eastern and South Eastern European Studies. As part of the project a two day international workshop was held in the HPS Department in Budapest in February 1999. The lectures delivered by the participants of the workshop were based on expert essays analyzing different areas of von Neumann's work on foundations of quantum mechanics. 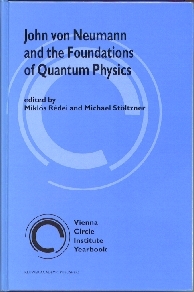 The essays have been published in the first part of a volume entitled John von Neumann and the Foundations of Quantum Physics, click ref. for the details of the book. The second part of this volume contains hitherto unpublished documents related to von Neumann and works by him; among these works are the typescript of his "Unsolved problems in mathematics" (Address to the International Congress of Mathematicians, Amsterdam, September 2-9, 1954) (see  describing von Neumann's talk and its historical context), and von Neumann's unpublished manuscript "Quantum mechanics of infinite systems". These unpublished works were located by M. Rédei during an archival search of the Library of Congress (Washington, D.C., U.S.A.) while he was staying in the Dibner Institute for the History of Science and Technology (MIT, Cambridge, U.S.A.) in the academic year 1997-1998 as a Senior Resident Fellow. The second phase of the project (2001-2003) aims at editing and publishing a volume of selected letters by von Neumann, this phase is supported by a research grant from OTKA (principal investigator: M. Rédei). For further works related to von Neumann's activity in the area of foundations of quantum theory see [3 ] and . M. Rédei: Mathematical Intelligencer 21 (1999) 7-12. M. Rédei: "Why von Neumann did not like the Hilbert space formalism of quantum mechanics (and what he liked instead) Studies in the History and Philosophy of Modern Physics 27 (1996) 493-510. M. Rédei: "John von Neumann's concept of quantum logic and quantum probability" in . L. E. Szabó: "Critical reflections on quantum probability theory", in .